Do you feel like painting is a hassle? Do you wish it was easier and not as messy? I used to feel the same but now furniture painting is so relaxing to me. Plus, it’s cheaper than therapy! After refinishing so many furniture pieces, I have found what works and have made enough mistakes to know what doesn’t! 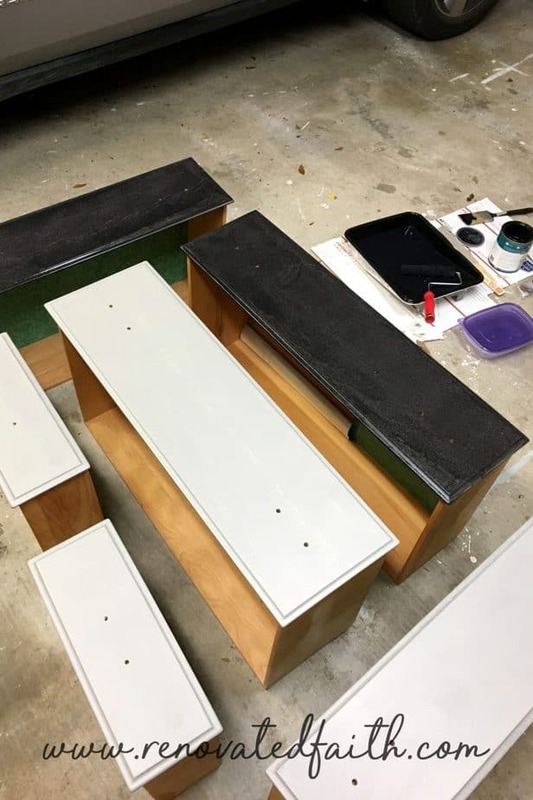 So, I have compiled my best, low-cost tips for painting furniture to ensure the process is fast and easy, with no expensive paints necessary. 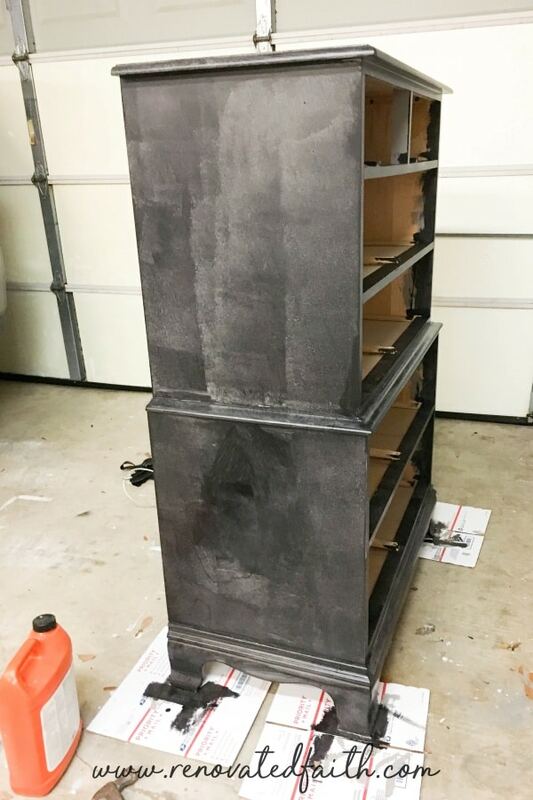 A few days ago, I checked my Timehop App and saw the “After” pic for a piece I refinished a while back… How long ago was this update? According to Timehop, it was 10 YEARS AGO!!! Although it made me feel a little old, I also realized I’ve learned a lot in that time. It’s so much fun to take a furniture piece from one extreme to another. This dresser was actually in really great shape and needed no repairs at all before sanding. It just needed a change of color! Just like with anything, learning how to paint furniture takes practice, but I hope to save you from most of my mistakes along the way! As I wrote in my post Why I Don’t Use Chalk Paint, I don’t use chalk paint or any other expensive paints so these tips will help you stay on budget as well! I also share here about the best latex paint for furniture. As a free gift for subscribing to the weekly newsletter, I will send them straight to your inbox. 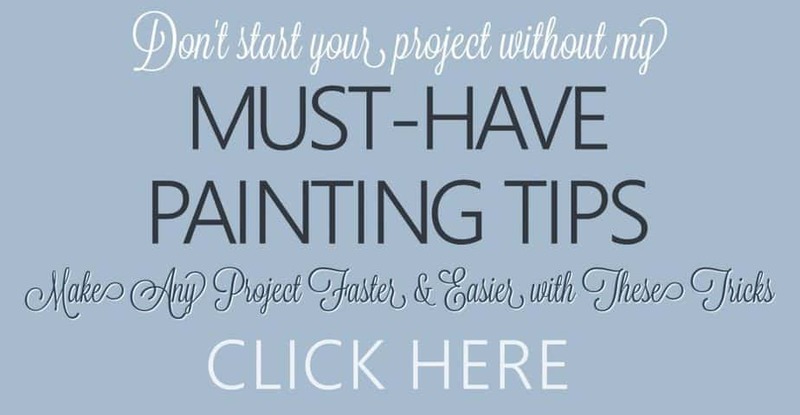 JUST CLICK HERE to download my Must-Have Painting Tips. I basically thought about the tricks that save me the most time and effort and help me to get a beautiful finish every single time. Don’t start a project without my DIY furniture painting techniques and tips! I used the same tips on this fabulous dresser. Whether you want to know how to paint furniture shabby chic or more contemporary, these tricks will make the process go much smoother. 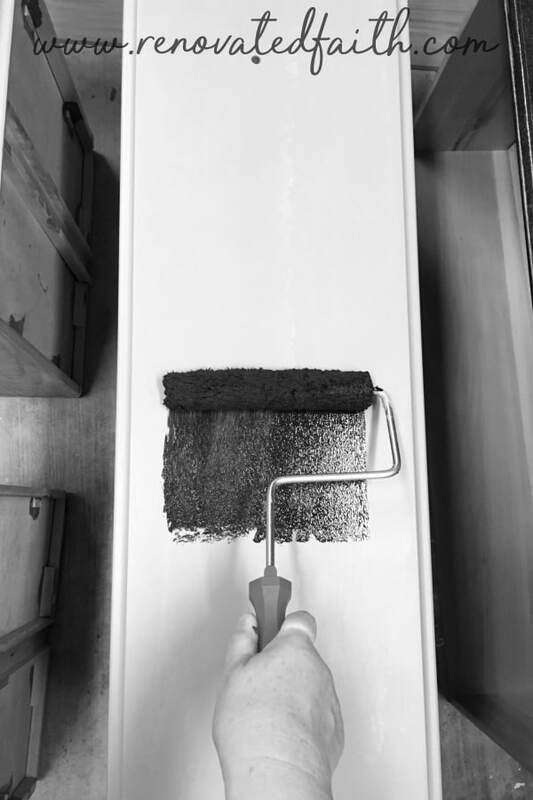 If you are wondering how to paint furniture white or how to paint furniture black, these tricks all still apply but you want to read about tinted primers in the two posts links below. 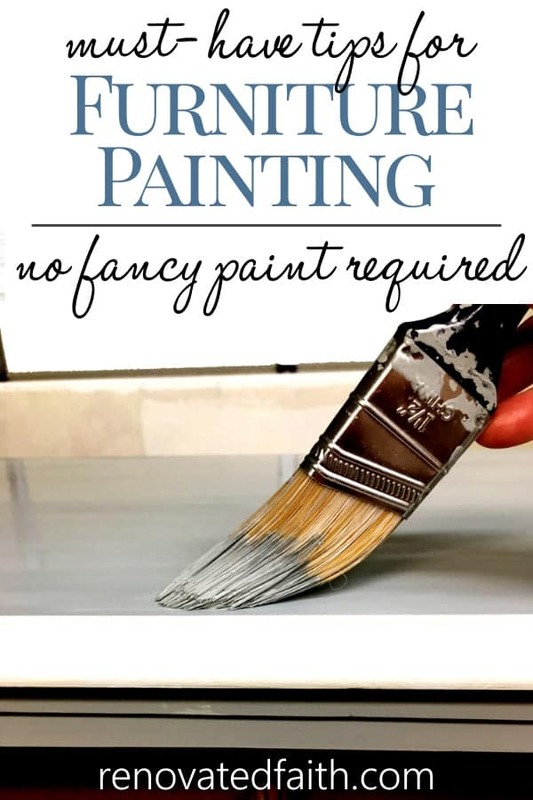 As far as what kind of paint to use on furniture, the best paint brand for furniture or how to paint furniture with chalk paint be sure to visit my two posts Why I Don’t Use Chalk Paint and A Better Alternative to Chalk Paint. 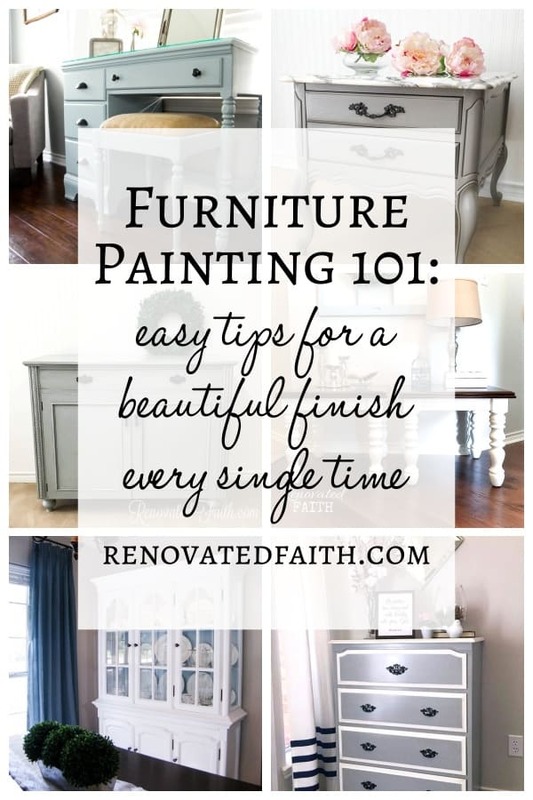 Many readers have asked me how to paint furniture without sanding. The process I use does involve sanding but the tips involved save time and effort in the long-run for any of your . 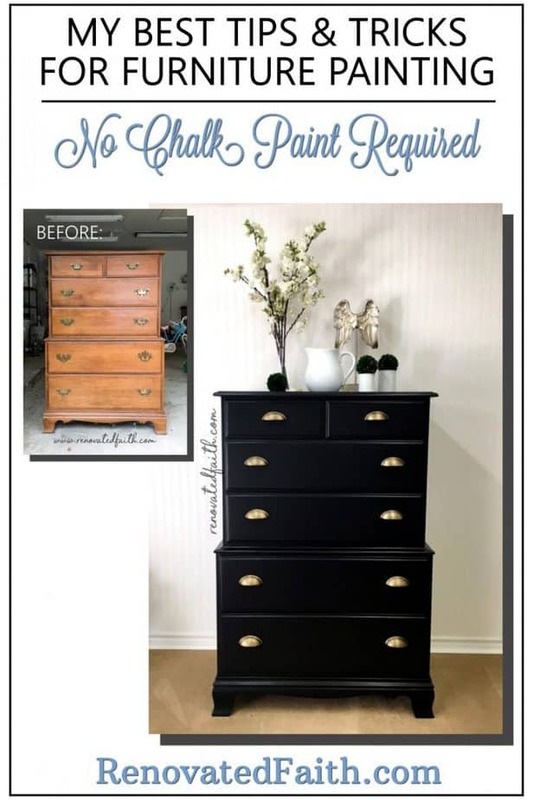 With my better alternative to chalk paint, you’ll save time, money and effort when painting wood furniture! 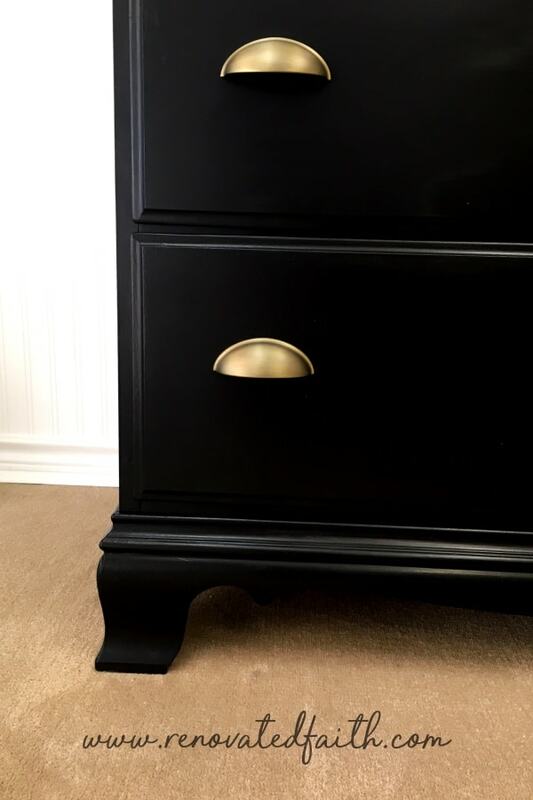 As I was working on this tallboy dresser, I thought once again about how life is like one big furniture flip…or lots of little ones depending on how you look at it or what you’re going through. God so graciously transforms life’s messes into something full of beauty and purpose if we let Him. Giving over bad habits and addictions to God is never easy but without God, it’s impossible. Sometime we come to a place of transformation out of pure necessity. We learned that our old coping mechanisms and vices are no long working for us and even make matters worse. As we begin to allow God to transform us, we go through the painful process of handing over our old habits to trade for healthier ones. I learned during a time of anxiety and also in my struggle with emotional eating that sometimes things get worse before they get better. So often, the deep-set tendencies that are destroying us are the ones that we struggle to cling to the most. But God never asks us to give up something that He will not replace with something far better. 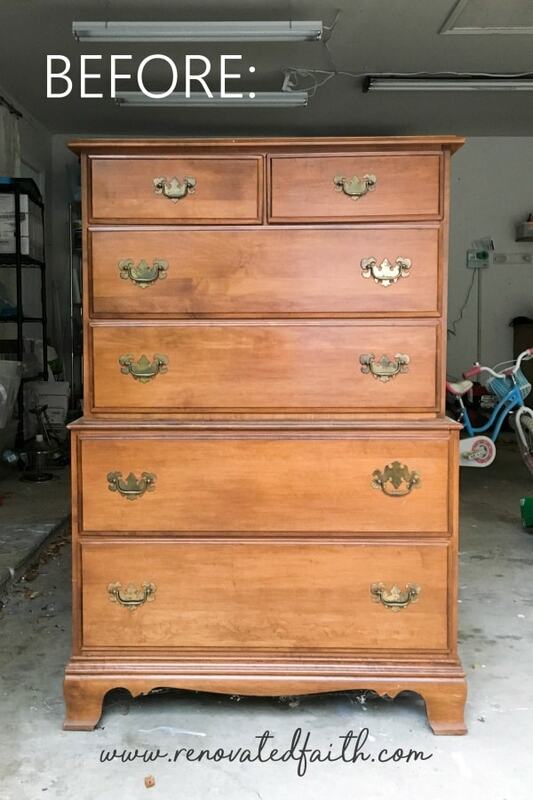 Just like this dresser, sometimes things look the worst mid-transformation but we can rest in knowing that this too shall pass. God isn’t going to leave this project half done but will finish what He has started in you. 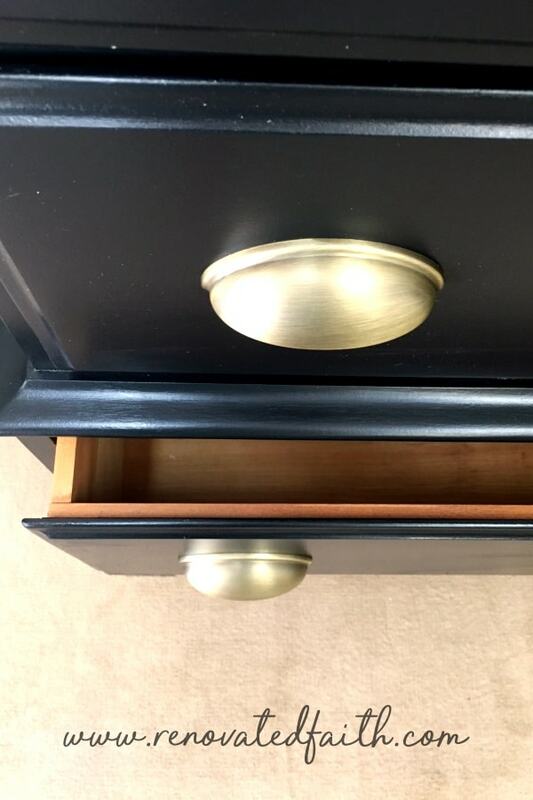 If you found yourself in the middle of an overhaul, hold on tight, the best is yet to come – just like the final transformation of this dresser. RENOVATED THINKING: Sometimes when overcoming struggles, fears and addictions, the road gets rockier before it gets smoother. However, we can rest in knowing that God never asks us to give up something He will not replace with something far better. My friend Brittany actually sold this dresser to me a year ago. In the same amount of time it took me to start this dresser, they built a brand new house! How’s that for procrastination!? Needless to say the dresser will look much better in someone’s home than in the back of our garage. 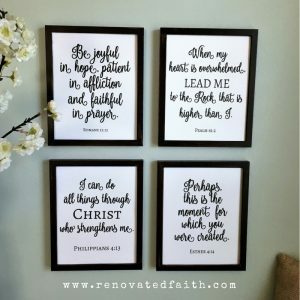 If you are looking for something to listen to while working on furniture, check out my post on the Best Christian Podcasts for Women. Sometimes I joke that furniture painting is cheaper than therapy but in all honestly it’s not only cheaper but probably more effective since I listen to these podcasts which encourage me in my faith. 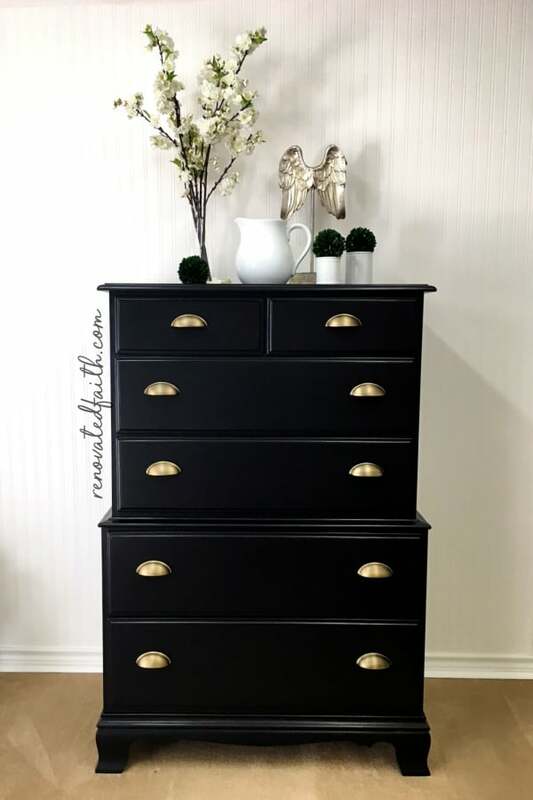 To see the EXACT process I used for this black dresser, go to my post My Better Alternative to Chalk Paint. For my other furniture flips, you can check them out by clicking HERE. What a wonderful post! And so perfectly timed for my own life. I’m new to your blog Karin, but I will be telling my friends to follow you! Today’s post touched me on so many levels! I’m new to this business, have started a business based on advice from a dear friend that pointed out that there really is a need for interior design for folks on a budget. My father raised me working by his side, taking time to teach me the skills to perform all sorts of handyman type task. I love seeing another woman with the same mind-set as my own. Bless you, and thank you for the free advise and sharing personal experiences. So many people are unwilling to admit that life has not been easy, which sometimes leaves the rest of us feeling alone in the quest to have a more fulfilling purposeful life! Cythnia – your comment just made my day! Thank you so much. DIY projects are so analogous to life and God keeps showing more and more through them. Of course! Thanks for stopping by Kathy. I love the way it turned out! I may need to buy it back! Haha j/k! Kind of! ? Ha! It only took me a year.